The MWC is nearing, and we are expecting to see a lot of smartphones launching at the biggest smartphone event of the year. The Galaxy S9 duo is set to launch just a day before the MWC kicks off, i.e., on February 25. 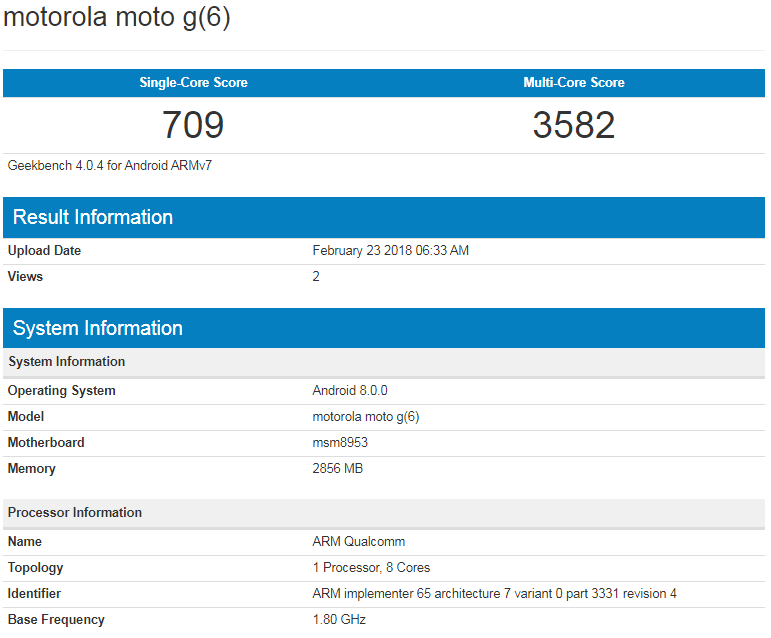 At the MWC, we are sure that Motorola will be launching its 6th Gen G-series smartphones, the designs of which have already leaked out, thanks to the press renders. Just yesterday, we got another image showing the Moto G6 Plus in all the color options. Today, the regular G6 was spotted on Geekbench which confirmed a couple of specifications. Well, the Geekbench listing shows the motherboard ‘msm8953’ which is the Snapdragon 625 processor. It is quite interesting since previous reports suggested Snapdragon 450 for the G6. Along with that, there is 3GB RAM, and the phone runs on Android 8.0.0 Oreo out of the box. The phone scores 709 on the single core while 3582 on multi-core which is way lesser than the scores of the Moto G5 Plus of last year which was launched with the same chipset i..e, Snapdragon 625. This might be because the details on Geekbench are wrong. The phone is coming with Snapdragon 450 out of the box. Some other specs include a dual camera setup, an 18:9 display, glass and metal design and more.